From HAKAI MAGAZINE, Nov. 20, 2018. Photos by Grant Callegari. In the twilight hush of the fanciest restaurant in town, Paul Griffiths pulls out a tiny device that looks like a primitive cellphone and sinks it in his water glass. He’s trying to figure out where the water came from—here, Campbell River, a small coastal community in British Columbia, or somewhere else? The instrument, an electrical conductivity meter, reveals the path the water took from its source to Griffiths’s glass by measuring the charged minerals picked up along the way. “Twenty-two, 23, 24 …,” says Carol Ramsey, reading the display. A server orbiting past the table stops midstride and stares. “We’re just testing the conductivity of your water,” Ramsey says cheerfully. “Do you know where this ice came from?” Griffiths asks. “Uh … the ice machine? I’m not sure,” the server says shyly. “Is it possible to get a glass of just tap water?” Griffiths suspects the ice is bringing down the numbers. Maybe the ice was shipped in from the nearest big cities to the south, Victoria or Vancouver, where drinking water comes from reservoirs. The server returns with a glass of ice-free water. Immediately, the reading climbs past 40. The higher number is a geological tell. It’s proof that the water ran underground through karst, an underground ecosystem of dissolved rock. This is a chronicle of karst, one of Earth’s most underappreciated ecosystems, so vast and unmapped, many explorers and biologists consider it the next frontier of terrestrial and extraterrestrial discovery. NASA scientists are probing deep into karst systems as part of their research into organisms that thrive in hostile environments to better detect life elsewhere in the solar system. If a karst landscape and its glorious biodiversity fail to grab the same attention as the Amazon jungle does, that’s because you can’t see the karst. Or can you? A karst biologist will tell you it’s right there in front of you; the forest above is an extension of the karst. That Griffiths has devoted pretty much every spare minute and every penny of his earnings for the past 40 years to karst, well, it’s hard to say whether that speaks more of the karst or the man. Griffiths, who is 67 and looks a bit like The Lord of the Rings director Peter Jackson, could be called many things. Defender of karst. Explorer of karst. Explainer of karst. He cannot yet officially call himself a karstologist—at least not until the stack of paper piled sternum-high in his Campbell River home transforms into PhD credentials, likely by Christmas. However, his colleague Carol Ramsey, who, in Middle Earth, might be the elf Galadriel’s older sister, is a karstologist—one of a handful of scientists in Canada with that title. In this country, karst studies are typically a subspecialty of geology. In Europe, karst science is well established. Ramsey got her PhD at the prestigious Karst Research Institute in Slovenia. The PhDs are strategic. Out-credentialing everyone lends this team of two the power to influence environmental practice—in theory. Logging has forever altered much of the karst ecosystem on British Columbia’s coast, particularly on Vancouver Island with its accessible forests. And a ready, aim, fire approach to development threatens to make moot the most basic of questions: what is it about the structure of karst that makes it so sensitive to disturbance? In their fight to protect what’s left of the ecosystem, the pair’s prime tool is data. We simply do not know exactly how much coastal karst is left. And so Griffiths and Ramsey have made it their task to monitor the bejesus out of their patch: the whole northern half of Vancouver Island. In a project that falls somewhere between a duty, a calling, and a cosmic test of character, they routinely tramp through first- and second-growth fir and hemlock forests, meticulously documenting changes in the topography. They fly over the land snapping pictures to create a photographic time series. They take soil samples from caves where they know logging will happen overhead—before and after the trees are gone. They scan newspapers for legally required notices of independent power projects and suss out whether there are implications for the karst. They lobby for toothier legislation and push for enforcement of policies already on the books. Though Ramsey is no less ferocious in her commitment, Griffiths has the bigger body of work because he’s simply been in the game longer. Ramsey first met Griffiths while she was studying environmental archaeology at the University of Victoria in the early 2000s. Griffiths, who knew of a cave with the potential for old faunal remains on the west coast of Haida Gwaii, British Columbia, volunteered to take her to check it out. They found bear bones, which were carbon-dated at 14,000 years old—among the oldest recorded bear bones in British Columbia at the time. Personality wise, they are karst and cheese. Ramsey is a quiet, sensitive soul, the person you never know is the smartest one in the room. Griffiths has the charged energy of an entrepreneur, the confidence of a history lecturer safe in his tenure. He is Noam Chomsky by way of Spalding Gray—an academic storyteller. Because stories are the most effective delivery system for big ideas. “This is the next battleground,” says Griffiths, running his eyes to the horizon. “Or it would be if people cared about karst.” He’s talking about the old-growth conifer forest stretching out below, in a slice of the Hankin Range known as the Kinman, 150 kilometers north of Campbell River. Where he’s standing, on the mountainside, there are no trees at all—just stumps and the odd purple flash of fireweed. Until the early 1990s, this too was old-growth forest on karst. Then it was logged. Then, in July 2014, it caught fire. A fire on karst can easily become a roaring blaze—the air cavities below the ground may feed it with oxygen like a barbecue. In this case, the highly combustible piles of dry stumps and slash left behind by loggers made perfect tinder. Intact temperate rainforest over karst is a rare thing. There’s a little left on the south island of New Zealand and some in Tasmania and a few other scattered places. But fully a quarter of what remains in the world is in coastal British Columbia. Another quarter is in Southeast Alaska. These forests enjoy a happenstance of perfect conditions—lots of rainfall, yes, but also a way for the water to get into the rock. Tectonic activity along the Juan de Fuca plate just off British Columbia’s coast fractures the rock a little more with every sizable tremor. As a result, the karst is self-draining. The soil never gets swampy. Tree roots get a skookum foothold in the crevices and microcaves, snaking deeper, drawing nutrients out of the ground. Merchantable timber grows like kudzu on coastal karst. In the early 1990s, Derek Ford a geologist and professor emeritus at McMaster University in Hamilton, Ontario, and his colleague Kathy Harding compared trees growing on limestone—this very limestone here, part of the Quatsino Formation—to trees growing on the adjacent volcanic formation. The karst trees grew fat. Irresistibly fat. Left to their own devices, timber companies would cream off the karst forest first. And that’s largely what they have done. Karst in Southeast Alaska was logged at three times the rate of other areas in the state. Timber companies so reliably cherry-pick the karst landscape that you can sometimes identify the extent of karst from the air. It follows the contours of the cut blocks. “You can understand the rationale for that kind of strategy—it’s just about the cheapest way to log,” says Tom Aley, a hydrogeologist who runs an independent consultancy called Ozark Underground Lab in Missouri and must be one of the very few people to own his own cave. But clearcutting on karst creates problems both on the surface and below it. Take away the trees and soil is cast adrift. It’s redistributed from where it should be—up top, governing the rate at which rainwater enters the underground streams—to where it shouldn’t be, in the aquifers. In these natural, underground cisterns, a dump of soil deoxygenates the water and starves aquatic organisms. More to the point, logging on karst is a killing-the-golden-goose proposition. A 1993 paper by Ford and Harding widely recognized as the shot heard around the karst world, had an intentionally provocative title that included the phrase, “Deforestation of Limestone Slopes on Vancouver Island.” Deforestation is an aggressive word. It suggests—as in the Amazon—that once the forest is gone, it’s gone. What comes back in the regeneration isn’t forest. It’s a timber farm. In their research, Ford and Harding studied a karst landscape clearcut in 1907. Ninety years later, “it really hadn’t recovered,” Ford says. When you clearcut on karst, what little soil you had goes AWOL. And the biodiversity is lost. The rest of the world has been a test case on this for millennia. The lesson goes back to the ancient Romans, who harvested the great pine trees on the Dalmatian karst on the southern tip of Croatia. “As soon as new trees got started, the sheep or the goats ate them,” Ford says. “The word karst means stony ground—stony because they wrecked it.” In the Middle East, the mythic Cedars of Lebanon—believed by some Christians to be the place where the resurrected Jesus revealed himself—grew on pure limestone karst very much like that of Vancouver Island. They were mowed down to build the temples of ancient Egypt and Jerusalem. The soil disappeared and never came back. Around one percent of the original cedars remain, in scattered, protected groves. Slovenia banned clearcutting on karst in 1949—but by then it was too late. There are photos, circa 1900, of babushka-wrapped Austro-Hungarian peasants hauling topsoil back onto the bald karst after it was clearcut. The Bordeaux region of western France, once home to karst forests also much like Vancouver Island’s, was logged long ago for the wood itself and agriculture. There, too, the soil vanished. Today, Bordeaux is winemaking country, and the big vintners view the region’s thick karst as a built-in soil supplement. Machines grind up the top layer of the limestone, adding calcium to the grape’s terroir and to the Bordeaux brand. But the top few centimeters of a karst system are the biological cream, dense with life. And plowing it like a beanfield makes the karst less porous for decades. “It’s an industrial approach that takes no account of the complexity and delicacy of the environment that they’re smashing up,” says Ford. We leave behind the grooves and fissures of the rundkarren and head south, bouncing along a logging road until we come to a trailhead pullout. Just inside the forest, an interpretive sign, containing more than a dozen typos and grammatical errors, advertises the Eternal Fountain—a fairly spectacular waterfall disappearing into a hole in the ground. Forty years ago, the British Columbia government, together with the now-defunct logging giant MacMillan Bloedel, tried to boost tourism on the north island by bugling the virtues of some geomorphic attractions within a 100-kilometer scenic drive called the Alice Lake Loop. The Eternal Fountain was one of them, along with the Devil’s Bath and the Disappearing River—karst formations all. The attractions were featured on recreation brochures and maps, and even included in the internal newsletters issued by MacMillan Bloedel. Employees and their families dutifully visited them on weekends. But the features have collectively become a kind of cautionary tale, a fact driven home on a cool spring morning when we pay each one a visit. At the end of a short boardwalk, the Eternal Fountain spills into its underground den as expected. But Ramsey and Griffiths are riveted by something else: on the embankment above the waterfall is a sinkhole, or doline, around two meters in diameter. As dolines go, the BC coast has some beasts. On Moresby Island in Haida Gwaii, there is a feature called the Great Depression. It is the size of Disneyland. Not far from here, in the Tahsish River valley 40 kilometers to the west, there’s a doline so big, a fall into its mysterious depth would probably be fatal. It’s called Paradise Lost. The doline above the Eternal Fountain is much smaller. But what’s remarkable is it wasn’t here when Griffiths and Ramsey visited two years ago. Griffiths offers his best guess on the doline’s appearance—logging upstream changed the hydrology. Nearby, similar declivities have appeared—some smaller, some bigger. In one spot, fenced off for safety, is a karst window, a deep hole in the rock giving a peekaboo glimpse of a running freshet beneath. A sinkhole in the woods is like a big Men at Work sign, except the excavator below your feet is water—with implications hard to fully fathom from the surface. Water runs through karst like a pinball through a pachinko machine. Its route, though tied to the glacial history of an area, is definitively unpredictable. Logging on karst is like bumping the machine, a small change that can radically affect the result. On the morning drive along the loop, between watersheds pocked with clearcuts, we keep crossing bridges over dry riverbeds that once carried the water overland, boinging up and down on roads that were once more or less flat. Rerouted water is changing the architecture below. The effect on the topography is even more pronounced as we near the Devil’s Bath. It looks like a crater lake, similar to the cenotes on Mexico’s Yucatan Peninsula. The bath was once one of the most majestic features on the north island. In 1984, MacMillan Bloedel logged right up to the north rim of the bath. In 2012, the entire area was clearcut to within 18 meters of the observation platform. People mostly stopped coming to visit after it lost its postcard charm, its disturbed setting now the feature’s main trait. Griffiths and Ramsey have kept tabs on the Devil’s Bath since the clearcut. Two years ago, the mossy forest ground nearby was mostly flat, like a green rug pulled over a toy-strewn floor, but as we bushwhack through alders and salmonberry, across the rolling land, the ground sinks underfoot. Logging in the catchment area rerouted groundwater, Swiss cheesing the bedrock below. The whole forest feels as if it’s about to collapse. In one spot, the earth has dropped at least three meters. But strangely, Griffiths’s mood lifts at the discovery. The collapse has revealed an entrance to a cave. Not all caves are karst, but caves are a common feature in karst, and, like an Amazon biologist who discovers that a botfly has laid eggs under his skin, bad news, but too cool not to be excited about. Griffiths has to investigate. He’s just in running shoes because he hadn’t expected to be exploring a new grotto today; there was none here last time he checked. In a flash, he’s down the hole. The glow from his headlamp fades as he descends. It’s completely fitting that Griffiths jumped into a new entrance to the underground. His introduction to karst came by way of caves. The family moved to Vancouver Island, and Griffiths’s father soon settled in for a long tenure at the University of Victoria. For years, up to and including his 25-year-long post as head of the British Columbia Speleological Federation, Griffiths voluntarily mapped every reported new cave on the north island—a painstaking process, involving sketching and measuring in three dimensions. Griffiths attributes his digressive thinking to so much time spent in caves. “In a cave you look left, right, up, down.” His mind likewise follows every spur line. As an environmentalist, Griffiths realized that when it comes to karst, caves were the best route into the public’s imagination, and, through this engagement, a pathway for protecting karst. In the 1980s, when he lived in Gold River, over 50 kilometers southwest of Campbell River, monitoring environmental impacts for a timber company, he pitched to the town council the idea of selling the remote village in the middle of the island as a tourist destination—the cave capital of Canada. Then he held his tongue as city officials got a little too enthusiastic about the idea and created a summertime festival called Caveman Days, where folks dressed as Fred and Wilma Flintstone. 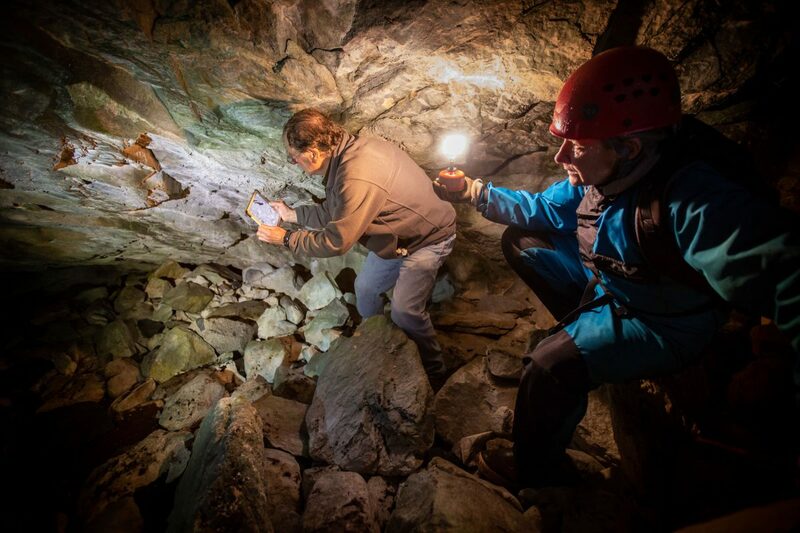 Another time, Griffiths and his wife, Karen, from whom he separated a number of years ago, hatched the idea to offer a one-day public tour of the underground glacier at White Ridge, a cave system in the mountainside high above Gold River. Twenty-five bucks got you a helicopter ride up and a guided tour of the caves. The offer proved so popular, two helicopters were kept busy all day long. “Our hidden agenda was, we planned to turn White Ridge into a provincial park, and we wanted to get the town onside,” he says. Mission accomplished; it became a park in 1995. Griffiths later managed to protect, or help protect, karst elsewhere on the island in the same manner: Weymer Creek, Artlish Caves, Clayoquot Plateau, and Horne Lake Caves Provincial Park, one of the most popular guided-cave operations in Canada. Yet caves, like karst, also have an intrinsic worth beyond their commercial value. The conditions inside a cave—the constant cool, photon-free darkness, the moisture buffered by dissolving salts—are perfect for preserving evidence of habitation, human and otherwise. On Haida Gwaii, expeditions into caves on the west coast uncovered ancient tools and cooking-fire ash, as well as bear bones dating back 17,000 years—even older than the ones Ramsey discovered. Partly because of those finds, the archipelago is further ahead of the rest of the province in its karst protection. Caves are an even richer lode of rare biology. “If you monitor a cave long enough, you will find a never-before-seen species,” Griffiths says. But a cave’s potential bounty is not enough to keep it safe from disturbance and harm. If a cave fails to prove itself significant for obvious cultural, archaeological, or biological reasons and isn’t actively protected, it’s likely toast. Just before it was dynamited, Griffiths documented the cave for Chief Chris Tom of the Tsartlip Nation. Then he turned his mind to the funding of Bear Mountain. The project hinged on a half-billion-dollar loan from HSBC. After a little probing, Griffiths discovered that the bank had adopted a policy called the Equator Principles, meaning that it couldn’t lend money to a project that was ecologically irresponsible or was inconsistent with Indigenous wishes. He picked up the phone, but his appeals went nowhere. Now the closest thing to a karst cave at Bear Mountain is the sand trap on the seventh hole. Caves are good at firing up the public’s imagination, and in a backhand way, inspire people to care about karst. But there is a dilemma. When you talk up caves to tourists, they want to check them out. Which is a little like getting bulls excited about china shops. “In some caves, the biggest disturbance is a water droplet falling from the ceiling once every thousand years,” Ramsey says. Caves are the last bastion of stasis in a world in flux. Like quietly praying monks, their benefits are sometimes intangible, but most of us value a world that allows them to exist. “Caves are perhaps .01 percent of all void spaces of a particular karst block,” Griffiths says. If you can’t get a park established, then what? Maybe you create a wildlife habitat area—if there was a cave with bats it would be automatically protected under that legislation. But then it’s about the bats, not the karst. Still, the karstologists would take any kind of protection. Linking caves to bats is one thing, but linking them to salmon—that would be even better, Griffiths thought. Griffiths emerges from the new cave he has discovered near the Devil’s Bath in mud-caked jeans, and we head downhill, hiking down to the river where salmon spawn. Exactly where those fish were coming from was a longtime mystery; there was no obvious path from ocean to stream. A few years ago, Griffiths got the notion that if, as he suspected, finfish ply the subway systems deep in the karst here, then karst is actually a wetland and potentially subject to stricter legislation through Fisheries and Oceans Canada. Whole karst landscapes have been protected because they’re wetlands—in the United States and elsewhere. So, underwater camera in hand, Griffiths hung out in a cave connected to the Devil’s Bath. And waited. Just when he was about to call it quits, two fat coho salmon emerged through a hole in the rock and swam past him. Griffiths’s amateur photo caught the attention of Canada’s national broadcaster. In 2015, CBC’s The Nature of Things devoted an episode to the biology not within the famed Great Bear Rainforest, a huge temperate rainforest spilling over northern British Columbia and Alaska, but under it. Videographers caught on film, perhaps for the first time, the passage of salmon through a karst system. Turns out Griffiths was right. People on the coast care about salmon. A lot. Back up those emotions with hard science and you have a powerful lever to save the karst as Jim Baichtal discovered in 2001. Baichtal, the forest geologist for Tongass National Forest in Southeast Alaska, conducted a tracer-dye study he now considers the game-changing moment for Alaskan karst—the demo that connected the dots between karst and salmon. Baichtal and a small team injected tracer dyes into forest streams associated with karst features and caves. Within 24 hours, the dye turned up in several fish streams over a kilometer and a half away. That’s fast. And it meant that surface disturbing activities like logging and road-building could send a whole lot of extra sediment along the same route with the potential to clog spawning channels and change cave environments. Also, without the forest to regulate stream flow, logged areas more often experience high flows. Fast-moving water flowing over a layer of sediment loses out on the full karst treatment, which removes more of water’s natural acidity and offers a leg up for salmon fry and eggs. The scientific work showed that what we do to the karst forest, we probably do to the salmon. A brute trade-off hung in the air: logs or fish. Alaska now has fairly robust karst management practices—largely drawn up by Baichtal, with input from other experts, including Griffiths. The US federal Cave Resources Protection Act also helps. Karst in Alaska is not completely off limits to logging. If a karst system is deemed closed—well protected on the surface and relatively self-contained—then it might be tagged “low vulnerability,” and timber companies might get a green light. That’s where the tension lies. Timber companies aren’t wildly eager to okay dye-tracing studies—they worry about the results. British Columbia, meanwhile, has limited legislation for karst; it only applies to logging and only in six districts. We’d no doubt pay karst more heed if karst water quenched most communities’ thirst. But, the percentage of drinking water in coastal communities that runs through karst is less than two percent. And since it’s tough to vividly conjure images of drought in the damp Pacific Northwest during another record February of rainfall, Griffiths has long understood that if you’re going to play the water card here, you have to play it differently. Griffiths’s endless creativity in his quest to save karst has saved only a bit of the ecosystem on the island. In a quiet moment after returning to Campbell River from the Devil’s Bath, Ramsey and Griffiths allow a little frustration to bubble up. “I keep excruciatingly detailed records of how long I spend in the field—of my data, of my mileage,” Ramsey says. And she’s harbored a secret dream of sending the government a symbolic invoice that would tally what she’s spent monitoring the resource for the past five years. “It probably runs well over half a million dollars,” she says. From Griffiths’s perspective, the battle to preserve the karst has felt increasingly like a rigged game. Since 1982, when Griffiths persuaded the government to at least create a karst inventory in one area, the rules have continually changed. More recently, the government has put cave and karst protection in the hands of the timber companies themselves. So following the voluntary standards and best practices for karst laid out in the unofficial playbooks written by Griffiths and a few others and released by government in 2003—is something they ought to do, are encouraged to do, but aren’t actually required to do. And so they very often don’t. Griffiths and Ramsey became karstologists thinking it would give them added pull to assess, and ultimately protect, the karst. But by current convention, pretty much anyone can call themselves a karst expert. Professional certification as a geologist seems to seal the deal regardless of karst qualifications. And, if they do have qualifications, it’s often through a three-day course Griffiths helped design in 2001. In the mid-2000s, Ramsey was reviewing a draft protection order for karst and called up a government official. “I assure you, we’ve had karst experts look it over,” she was told. The return email was bracing. This summer, on August 11, lightning strikes ignited a tinder-dry forest on northern Vancouver Island, and soon wildfires were encroaching on the Alice Lake Loop. Fire threatened other nearby karst areas, including Raging River, Tahsish River, and Artlish River, which together constitute much of the island’s remaining old-growth forest. Griffiths pulled up a photographic time series of those regions and matched them against the burning fires. Recently logged areas seemed to be acting as fuses, spreading the fires from one area to the next. It’s easy to imagine a future where British Columbia’s remaining coastal karst is unencumbered by old-growth forest cover and all trees are fully employed as logs. The land would resemble a feature in Ireland called the Burren—an expanse of rundkarren produced by overgrazing and logging, marked by fissures that hint at the fathomless void beneath. Ironically, today it is the Burren and Cliffs of Moher UNESCO Global Geopark. Travelers hike the ancient trails and perhaps inspect the alvars—plant communities unique to exposed limestone—viewing the rundkarren as a beautiful landscape deserving of preservation. Like the Europeans, we will recalibrate to what’s left.